The following posting is from Bird Studies Canada’s newsletter “Latest News” and relates to the Lewis’s Woodpecker which has been seen in New Denver. 3 May 2010 – The Committee on the Status of Endangered Wildlife in Canada (COSEWIC) has recommended that Bobolink be added to Canada’s list of species at risk. Last assessed by COSEWIC 10 years ago, it was also recommended that the status of Lewis’s Woodpecker be upgraded from Special Concern to Threatened, owing to population declines stemming from ongoing loss and degradation of its forest habitat. Two species (Whooping Crane and Acadian Flycatcher) were reconfirmed as Endangered, while Sprague’s Pipit was reconfirmed as Threatened, and Flammulated Owl was reconfirmed as Special Concern. Over 25% of the Bobolink’s breeding range is in Canada. It met COSEWIC’s criteria for Threatened status owing to significant population declines (88% since 1968) that are due to habitat loss and degradation, high levels of nest failure resulting from increasingly intensive agricultural operations, and threats faced on its wintering grounds in South America. A familiar species across eastern North America, the Bobolink joins a lengthy and growing list of other birds, plants, insects, and other wildlife that are designated as at risk and that depend on grassland habitats. Select this link to read COSEWIC’s press release. More detailed information about all the species assessed at the COSEWIC meeting, including plants, insects, mollusks, amphibians, fishes, birds, and mammals, can be found on the COSEWIC website. Spring is the prime season for migratory birds and just before nightfall small acrobatic birds may be plummeting into a brick chimney near you. If you witness such a sight the Fish & Wildlife Compensation Program (FWCP) wants to hear about it. FWCP’s Vaux’s (pronounced “voxes”) watch program is gearing up for the arrival of swifts in May. 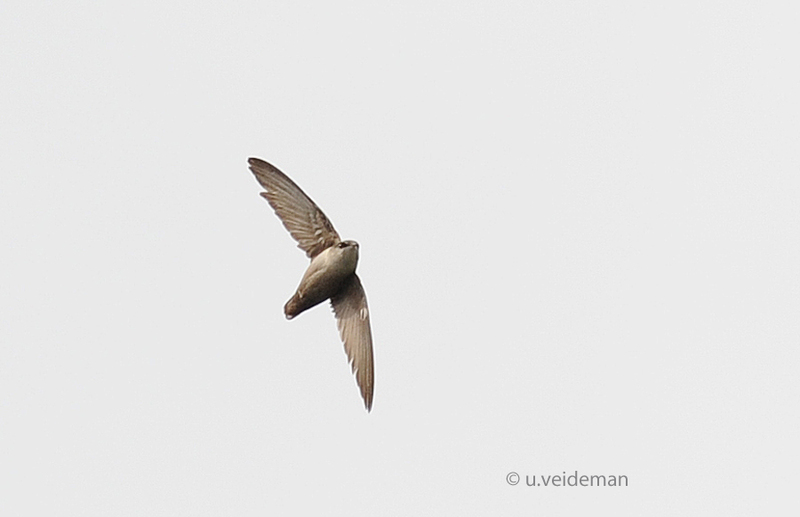 In spring the Vaux’s swift makes its northward migration using communal roosting sites en route. However biologists have little knowledge of these sites and without that knowledge there is little chance to protect critical habitat. What is known is that brick chimneys – residential and commercial – are favoured resting stops as the swifts refuel and head from the southern United States and Mexico. The Vaux’s swift is North America’s smallest swift and is relatively easy to identify. At dusk they gather in the darkening skies, wheeling around for 20 or 30 minutes before swooping dramatically into a brick chimney or hollow tree trunk. “They are quite a sight because communal roosting sites can accommodate from several tens of birds, to many thousands,” says FWCP public representative Gerry Thompson. In 2008 Thompson made nearly 30 massive Vaux’s swift nest boxes that have been distributed in various parts of the Basin. The southern portion of the Columbia Basin provides important habitat for Vaux’s swifts as many breed in the forests of the Interior Cedar Hemlock zone. More than half of their global breeding sites occur in B.C. In addition to roosting in larger chimneys, Vaux’s swifts also nest in smaller chimneys from June to August. Very few nest sites have been documented for this species but they are likely to occur in brick chimneys. Towns with older houses and historic buildings are most likely to support nesting birds. Historically the breeding and roosting sites consisted of hollow trees often found in old growth forests. With the creation of regional reservoirs and changes in forestry practices, however, such habitat has become more limited. In fact most recorded breeding and roosting sites are now in man-made brick chimneys; as more brick chimneys are converted to steel or aluminum, even this manmade habitat is in decline. The FWCP, which works on behalf of its program partners BC Hydro, the B.C. Ministry of Environment, and Fisheries and Oceans Canada to conserve and enhance fish and wildlife impacted by the construction of BC Hydro dams, is requesting reports of Vaux’s swift roosting and nesting sites. Please in-put any data you wish to provide on bird sightings. We are compiling a bird list for this area for other birders to use. I also provide data on birds that are nesting in this area to the BC “Breeding Bird Atlas”. Visit http://www.birdatlas.bc.ca/ for more information on this project. If you send the information on nesting birds to me I can file it with them, or consider joining the effort and you can send the data directly to the Atlas. There are three websites that I have found useful for bird identification. The Weaselhead Society in Calgary runs a beautiful website at http://blog.talkaboutwildlife.ca/ . Bird songs are available on their website as well as picture and descriptions. The website http://www.whatbird.com/ has a search engine in it that accepts input on bird descriptions and gives you back possible bird identifications. This is unique in my experience. For practicing bird identification through song, visit http://www.natureinstruct.org/dendroica/ This site is free and is worth the trouble of the sign in procedure. There are multiple pictures and bird songs for each species and the songs can be presented without the pictures for practice. I have provided links to each site on Chirp as well as above. We welcome all questions about birds. I have a large flock of white crowned sparrows at my feeder this week and saw a rufous sided towhee on May 1st. Also on Saturday the 1st an osprey was circling over the Orchard district of New Denver. The killdeer are back too. Last month we had a flock of widgeons that hung out with our local geese for weeks. I am noticing more gulls on the lake in the last year than I have ever seen before. There was a beautiful, male wood duck at my pond last week. He hung out at my picnic table, took a swim and toddled across the driveway to Margaret Hartley’s bird feeder. I think he hung out there a couple of days and then came back across the road for another swim. When my dog got close, he flew away. Gary Davidson said that they’re “unusual” but not “very unusual” here. I haven’t seen him in a few days. Lane, you are so lucky…I have seen harlequin ducks just under the bridge or in Centennial Park, but the only time I have seen a wood duck is in Creston. There are usually several in and around the pond at the front entrance where the painted turtles are. I saw seven Eared Grebes in the lake outside my place at 1:00 PM today. They were just poking around picking bugs off the surface of the water I believe. My camera is not good enough to take a picture of them. Earlier this year I had a single one in winter plumage visit, but these were in full colour. Their species name, negricollis, means black necked, which is how I identify them at a distance. Apr. 21 – first time I’ve seen a Western Meadowlark in Rosebery. There was only one with a group of other small birds. Harlequin ducks frequently seen in the bay by Rosebery – east of the log sort yard. On May 23 I observed an unusual-looking grosbeak, not an evening grosbeak, at our feeder in New Denver. I looked it up in our guide and it seems to have been a black-headed grosbeak. It came with a partner, then disappeared and came back with another pair, as if to say to their friends, “Free lunch on ninth avenue!” They were then scared off by a Stellar’s Jay. Don’t know if black-headed grosbeaks are considered rare around here but it was the first time I’ve seen one in nearly five years of birdwatching at our place. According to Gary Davidson, who has been birding in these parts for years (he lives in Nakusp) Black-headed Grosbeaks are frequent but not common visitors to the West Kootenays during spring and summer. He has published a Checklist of West Kootenay Birds, which you can get from him or next time I see him I will ask if he has any to hand out. I, personally, am happy for you to have seen and reported them. I have never seen one, having spent most of my life east of the Rockies. We have seen Common Loons at Summit Lake, Fish Lake and Bear Lake but have yet to see them on Slocan Lake. Does anybody know if they actually like to nest on the big lake? Because we have so little habitat that fits their needs I doubt if they nest on Slocan Lake. Bonanza Marsh might suit them. I will watch. Anybody else have any input? 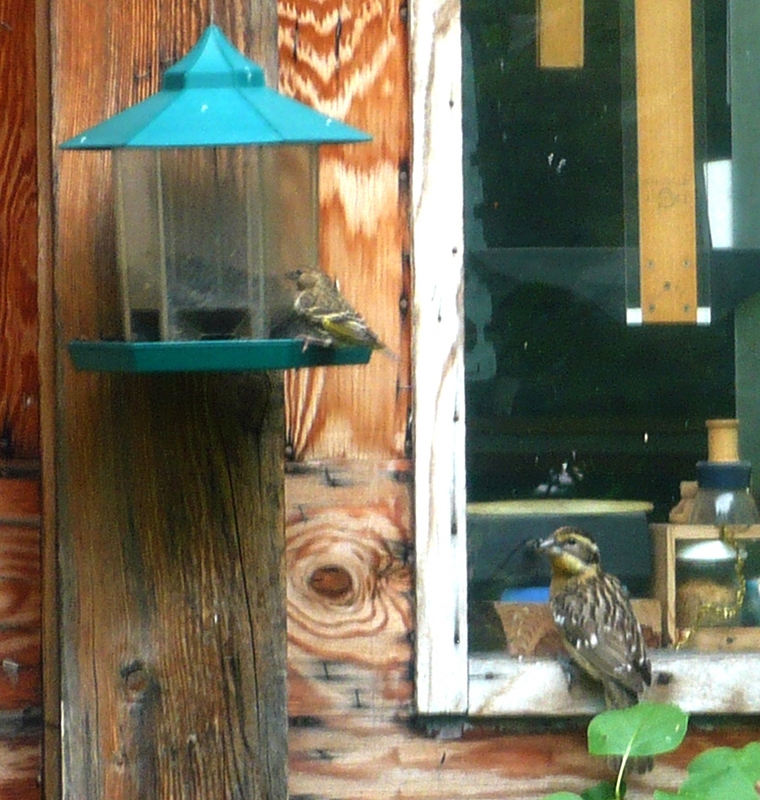 We have had a lone Black-headed Grosbeak at our feeder off and on for about a week now. He does not mix with the Evening Grosbeaks that are so plentiful at this location, and does not appear to have a mate. June 12: male lazuli bunting at the feeder today. First time this year. For the last two years, we have had 2 nesting pairs from about mid-June through the summer, who bring their fledglings to the feeders when they can fly. Will try to get photos. Glad to hear about the Grosbeaks. Some warblers are back… Yellow-Rumped, usually one of the first, are calling. I heard a Warbling Vireo at Summit Lake two weeks ago but nothing in Rosebery yet. Can you get a count on the number of nesting pairs of Barn Swallows in Silverton? I’ll do some observation on the Barn Swallows over the next few days. Had Yellow-Rumped Warblers here weeks ago – I’ll look up the date. Also have Wilson’s Warblers here – sop hard to spot in the foliage!